Not just editable, but there's also autocompletion of strings (not quite intellisense, as it's just one file at a time) and token/symbol recognition. Plus, this editor looked REALLY familiar to me. I started looking. I looked over at the Windows Azure Portal, where developers can write node.js to make web services directly in the browser. Here we've got dropbox autocomplete, tooltips with syntax errors and even some basic symbolic refactoring! Below you can see the editor in Azure Mobile Services throwing a tooltip syntax error. Is this happening on the server? 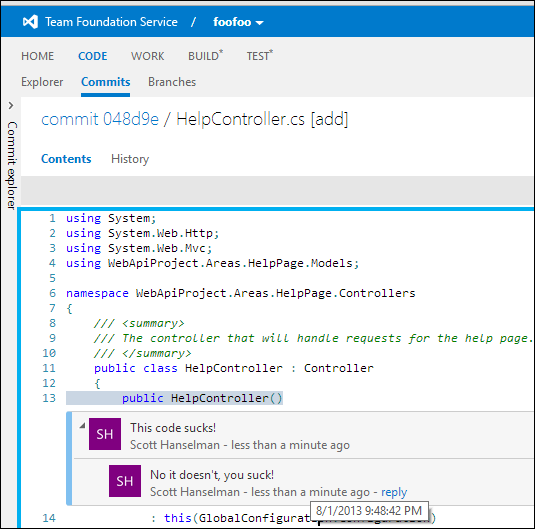 Then I went to look at TFS Online's stuff at http://tfs.visualstudio.com/ where I made an account http://hanselman.visualstudio.com to host private Git repos for side projects. I brought up F12 tools just to check. That's pretty unambiguous. Looking at the CSS by just clicking on editor.main.css. The "vs" in the div's class point to a vs-theme.css that I presume is to set the colors and make the text editor look familiar. 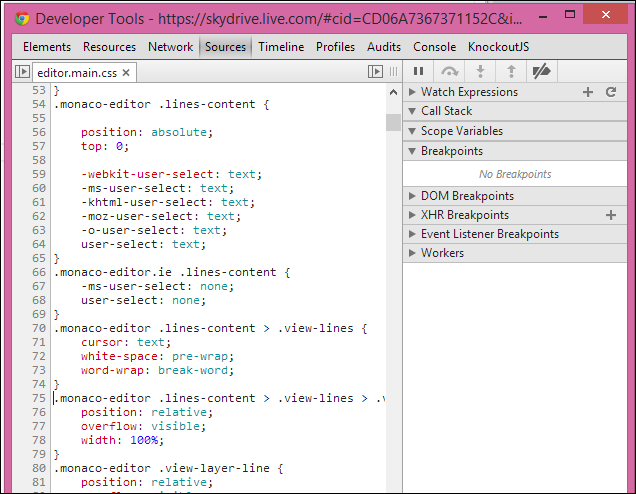 Looking in editor.main.js, it's all minified, but it's cool to see. That's really cool, I always figured editing code in a web browser would be one step to far, but this actually works quite well. All have their challenges, but still, it would enable a lot of new scenarios, or am I just fantasizing to much? I noticed the editor and all the services it implements when the TypeScript site went live and I keep waiting for MS to announce their cloud based Visual Studio. It's gonna be an awesome day when we can work from any computer anywhere in the world without having to install anything or setup out environment! It is already used in NAPA for building SharePoint-hosted apps. Very slick looking editor. Was surprised to find it already listed on a comparison page on Wikipedia. Would be cool to see it added to the list of projects that Microsoft has made open source, especially given its usage in the Azure and TypeScript teams! Interesting that the class is "editor-monaco" where monaco is the font that is being displayed. I'm assuming they have different font sizes based on the font that is being displayed (ie the font that is installed). Awesome! They market everything else like mad then let cool stuff like this just slide in? Yup amazing. I started noticing it while TypeScript was being launched and while I was working on my own framework for which I had made a proof of concept of an online IDE (complete with Table Designer, Editor, Query Manager, Screen Designer, Report Writer etc. - youtu.be/aB2OApKnfO8). Lots of hard work and lots of fun. Needs a team now and funding. Looking. 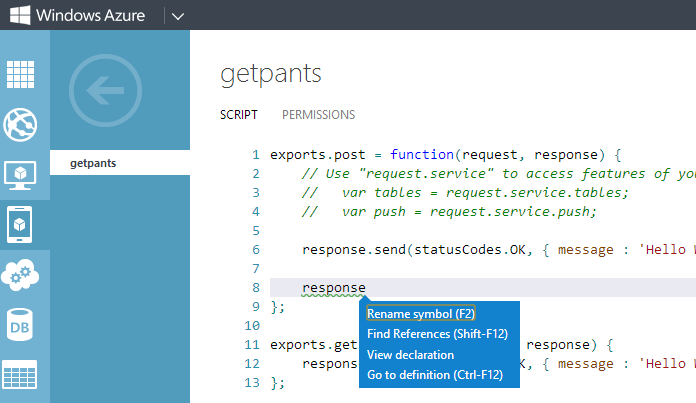 Nevertheless, its great to see this and exciting to edit online with intellisense and other goodies! Any chance this is open sourced? This library is supported for use in Windows Store Apps Only apps only. Regarding the inline threaded comments, if you update the file and the line numbers change - do they stick with the correct line? It's also used in VisualStudio and IE11's new F12 tools. My Surface RT is now even closer to a full fledged development machine now. I use it for some HTML/JS development and keep my code in skydrive, but now I may do this even more. You should check out Cloud 9, the address is c9.io - it's very powerful, even has command line! Works with .json files as well. Very cool. 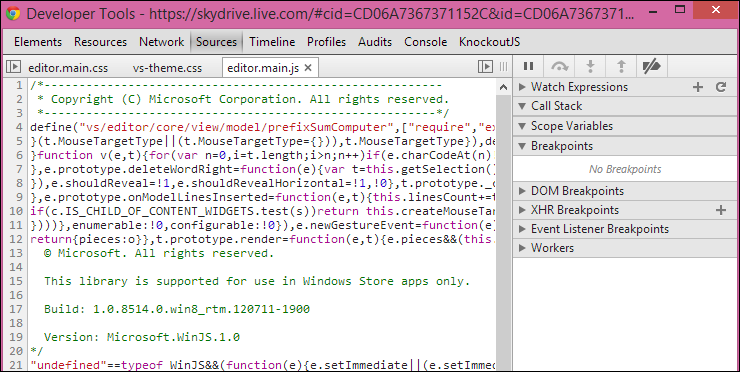 I wonder if you can host sites in SkyDrive yet like you can w/ DropBox. 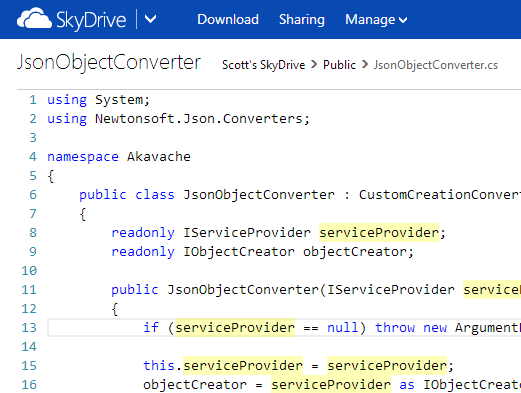 That'd be the next step of awesome for SkyDrive. Doesn't appear to do hosting yet, the editor does look awesome though! What's that star jazz in the Video tag CSS (*display, *zoom)? Very cool, I've been doing a lot of work with Ace lately (Cloud9's editor) but would be nice to have a typescript implementation to work with. I imagine would be good example as a TypeScript reference implementation anyway. @Clay Shannon, the *display (ie star-property) hack is for targetting IE <= 7. @Clay Shannon: It's a CSS hack. 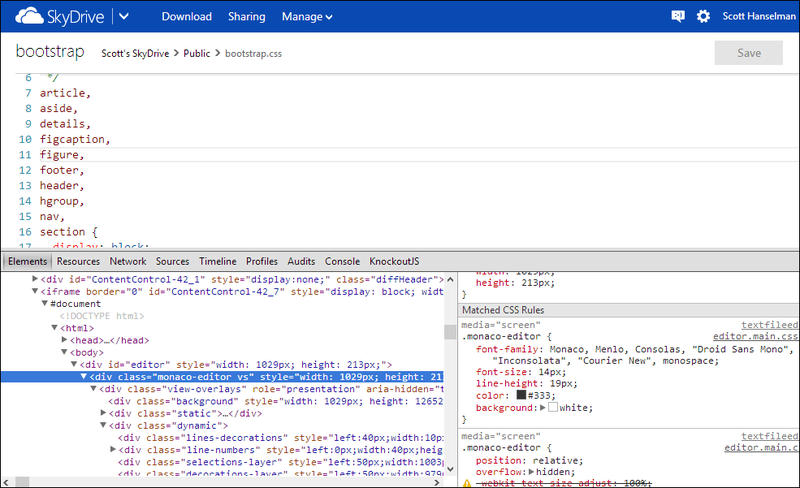 IE6 and IE7 pick up these properties as if you'd typed them without the star, whereas other browsers ignore them. 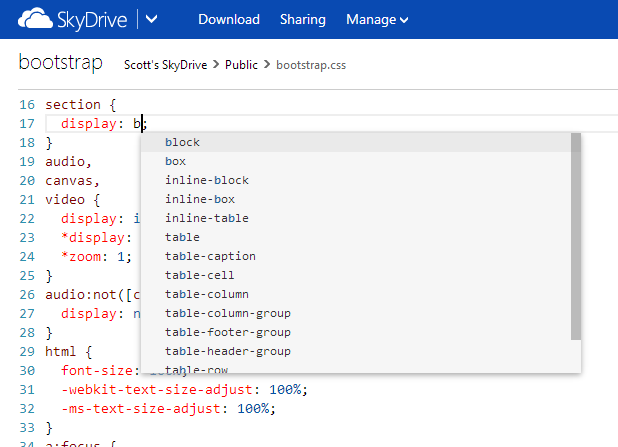 Text editor is eplained on CH9 Text Editor from SkyDrive with HTML5 by Greg Edmiston from the SkyDrive team so maybe you can reference it in your post. Having just got a surface pro, I realized that my .cs files were being uploaded to SkyDrive automatically. I had no idea you could edit them online, and it works wonderfully. Great tool for when I have a sudden idea how to fix something while at home from work! if someone is searching for an opensource editor: I did a little research an Ace (http://ace.c9.io/#nav=about) seems to be the best one. I know we're not quite there yet, but maybe in a few years, we'll have the Visual Studio Web App. @kenneth - make that a few months! I'm as surprised as you would have been in August.